Panderbear's previous post identified what economists think are the major causes of The Great Divergence, the multi-decade trend toward a more lopsided income distribution in the U.S. The three most important factors are the decline of labor unions, failures in our educational system, and excesses in the financial sector and in corporate lobbying of Congress. From the Taft-Hartley Act of 1947, to the breaking of the Professional Air Traffic Controllers Organization (PATCO) by President Reagan in 1981, to the present day attacks on public employee unions by several midwest Republican governors, the Republican Party has been unrelentingly anti-labor. Marginalization of labor unions is a significant contributor to The Great Divergence. In some respects our education system is in decline. As noted previously the aspects of failure most relevant to income divergence are decelerating rates of educational attainment and failure to equip students with skills needed in today's economy. These problems are not just a matter of money, but cutting the federal education budget and abolishing the Department of Education would be decidedly unhelpful. Republican candidates from Ronald Reagan, to Bob Dole, to Michele Bachmann have advocated demoting the department from Cabinet status or eliminating it outright. Under-regulation of the financial sector permitted unchecked growth of complex, highly-leveraged financial instruments based on sub-prime mortgages. This resulted in financial and real estate bubbles that inevitably burst taking down the entire economy. Increases in lobbying and investments in electoral politics have ensured Congress had little appetite for policies thought unsalubrious by Corporate America. Deregulation has been a battle cry for every conservative since, well, forever. However, Republicans have had much greater success in deregulating almost everything, including corporate campaign contributions, since the election of President Reagan 30 years ago. These are the major drivers of The Great Divergence. In every case the enabling public policies derived directly from Republican political orthodoxy. Republicans seem little troubled by our historic income imbalance and believe more extreme application of the policies that got us here is what the economy needs. Panderbear respectfully disagrees. Let's take another look at the data gleaned from the Census Bureau Historical Income Tables by political scientist Larry Bartels, this time in graphic form. 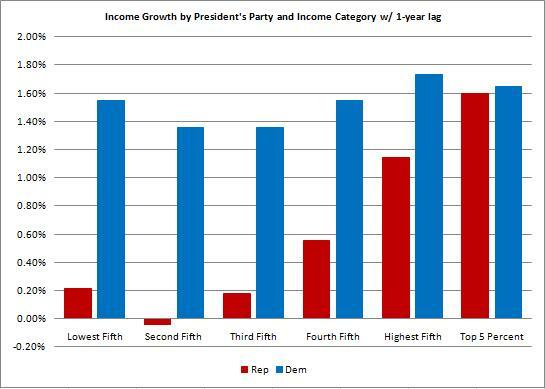 It speaks volumes about the efficacy of Republican economic dogma.